Free chlorine is one of the oldest and most common forms of disinfection, chlorine improves water quality by destroying disease-producing microorganisms, and by reacting with other organic and inorganic substances. 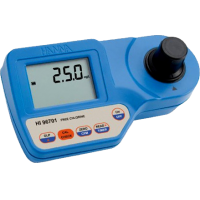 Chlorine levels must be actively monitored to ensure sufficient chlorine is present for disinfection, as well as to control adverse effects, such as taste, odor and potential reactions with organic matter to form harmful disinfection byproducts. 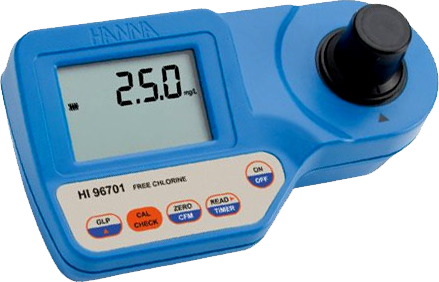 The HI96701 uses an adaptation of the USEPA method 330.5 and Standard Method 4500-Cl G to measure free chlorine concentrations of less than 5,00 mg/L (ppm). When the DPD reagent is added to samples containing free chlorine, the sample will turn a pink hue; the greater the concentration, the deeper the color. The associated color change is then colorimetrically analyzed according to the Beer-Lambert Law. This principle states that light is absorbed by a complimentary color, and the emitted radiation is dependent upon concentration. For free chlorine determination, a narrow band interference filter at 525 nm (green) allows only green light to be detected by the silicon photodetector and omits all other visible light emitted from the tungsten lamp. As the change in color of the reacted sample increases, absorbance of the specific wavelength of light also increases, while transmittance decreases.